Welcome to my new website and blog! I am so excited to have released this new site and with it a blog. I have been dragging my feet on blogging for FAR too long so it is about time I have one to share all my amazing clients, my personal projects, and more with you guys! I have THE BEST family…I’m not just talking about my husband and kids, although they are amazing, but I mean all of them…my husband, kids, parents, brothers, in-laws, sister-in-law, brother-in-law, all of the extended family, and friends that have become family. They are the most supportive people and I am SO blessed to have them surrounding me on this journey of life! I was born in Germany! My dad was stationed there when I was born and my parents moved as soon as I could fly after my birth. This also means for the first few weeks I didn’t have a bed so I slept in the bottom drawer of a dresser! My husband and I visited the town I was born in when we went backpacking through France and Germany about ten years ago – the hospital I was born in has been converted to a police station. I LOVE being outside… at the beach, going to the zoo, at a park, in my backyard, going to a sports game, etc. As long at the humidity isn’t too bad or I don’t have to wear too many layers I enjoy being in the fresh air! I enjoy most “crafty” things but I my favorites are sewing, scrapbooking, and painting. My older two kids also really like crafts, or “projects” as they call them, so these days most of my craft time is spent with my kids…my favorite recent project is a step stool all four kids and I worked on together that has the kid’s footprints on it. I don’t like apple pie! I know…who says that?!? It’s sadly true. I really don’t like cooked apples and have never liked apple pie. I swear I am still American! I would love to get to know you all – leave me a comment with a random fact or two about yourself! 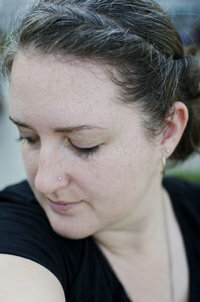 I can’t wait to learn more about everyone and share all that is going on over here at katherine mcpherson photography. Thanks for stopping by!